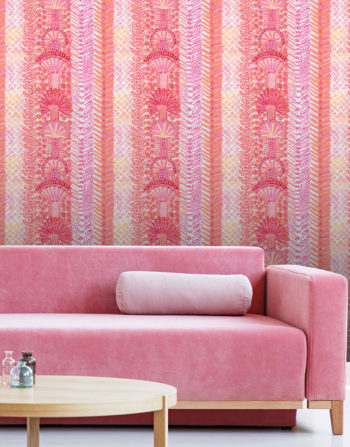 This brand new, beautiful ‘Pink Pom-pom’ wallpaper is all set to get you and your home rocking spring and summer vibes, whatever the time of year! The stunning design showcases a palette of perky and pastel pinks and Lucy’s whimsical botanicals form the basis of a more traditional striped pattern. Pink Pom Pom will add colour, impact and happy to your home interior. Perfect for an entrance hall, bathroom or a family room.